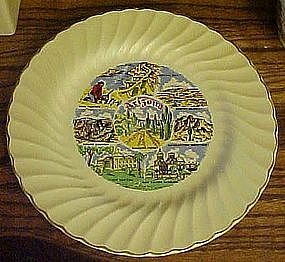 Nice vintage state souvenir plate for the state of Arizona. Made by Sheffield, USA. Has a diameter of 10". Pretty shell twist border with gold edge trim. Various colorful points of interest associated with the state. Grand Canyon, Painted desert, saguaro cactus, Superstition mountain and other sights the state is famed for. No chips or cracks. Nice condition.